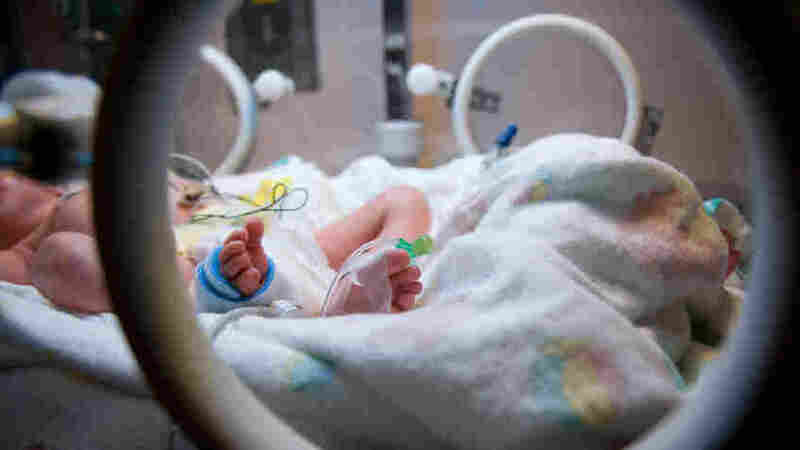 Feds Fault Preemie Researchers For Ethical Lapses : Shots - Health News Infants received different levels of oxygen to see which was better at preventing blindness without increasing the risk of nerve damage or death. But the federal government says doctors in the study didn't tell parents enough in advance about the "foreseeable risks" to their children. How much oxygen should severely premature infants receive? A study that sought to answer the question has been criticized for not fully informing parents about the risks to their children. Federal officials say a large study of premature infants was ethically flawed because doctors didn't inform the babies' parents about increased risks of blindness, brain damage and death. The study involved more than 1,300 severely premature infants at nearly two dozen medical institutions between 2004 and 2009. The infants were randomly assigned to receive two different levels of oxygen to see which was better at preventing blindness without increasing the risk of neurologic damage or death. In a March 7 letter, a Department of Health and Human Services official told the researchers that the study "was in violation of the regulatory requirements for informed consent" because parents weren't told in advance about the "reasonably foreseeable risks." In fact, the consent form signed by parents "did not identify any risks" from subjecting the infants to either the low or high levels of oxygen used in the study," writes Lisa Buchanan of the Office for Human Research Protections, part of HHS. The study, published in 2010 by the New England Journal of Medicine, showed that infants who got the higher level of oxygen had more than twice the incidence of severe blindness, while infants who got the lower level were slightly more likely to die. Among the 654 babies in the low-oxygen group, 130 died — 3.2 percent more than in the high-oxygen group. In the high-oxygen group, 91 of 509 developed blindness — a rate of nearly 18 percent, compared to 9 percent in the low-oxygen group. The study was designed to address a long-standing problem in the care of very premature babies. It's known that if they get too much oxygen, that can cause blindness from a condition called retinopathy of prematurity. But if they don't get enough, they can suffer brain damage and death. About 500 infants a year become legally blind from this condition, out of about 28,000 US infants born every year weighing less than 2 3/4 pounds. The feds' letter was addressed to Richard Marchase, an executive at the University of Alabama at Birmingham, a lead institution in the multicenter study. Marchase says, in an interview with The New York Times, that the death rate of infants in the low-oxygen group was actually lower than a similar group of infants born around the same time who weren't in the study. He also maintains that all the infants in the study were given enough oxygen to keep their blood levels within the standard range. But the HHS letter takes issue with that contention. The study was designed, it said, to give infants in the high-oxygen group "more oxygen than average infants receiving standard care, and infants assigned to the lower range received less." Marchase seems to acknowledge that the study's informed consent language could have been better. In the future, he tells the Times, "We will to the best of our ability let the subjects or their parents know as thoroughly as possible what previous studies suggest in terms of risk. We are going to be very sensitive to that going forward...."
The flawed consent forms were approved by ethics committees at all 23 medical centers involved in the study. They included such prestigious institutions as Stanford, Yale, Duke, Tufts and the University of California, San Diego. The ethical problem came to light because a consumer group called Public Citizen called on HHS Secretary Kathleen Sebelius to apologize to the parents of the 1,316 infants who agreed to participate in the study. "The word 'unethical' doesn't even begin to describe the egregious and shocking deficiencies in the informed-consent process for this study," Dr. Michael Carome of Public Citizen's Health Research Group says in a press release. He says it's likely that many parents would not have agreed to enroll their infants in the study if they had known about the risks. Carome formerly worked for the HHS Office of Human Research Protections. In addition to an apology from Sebelius, Public Citizen calls on HHS to investigate "how the HHS system for review and oversight of clinical trials failed so miserably."